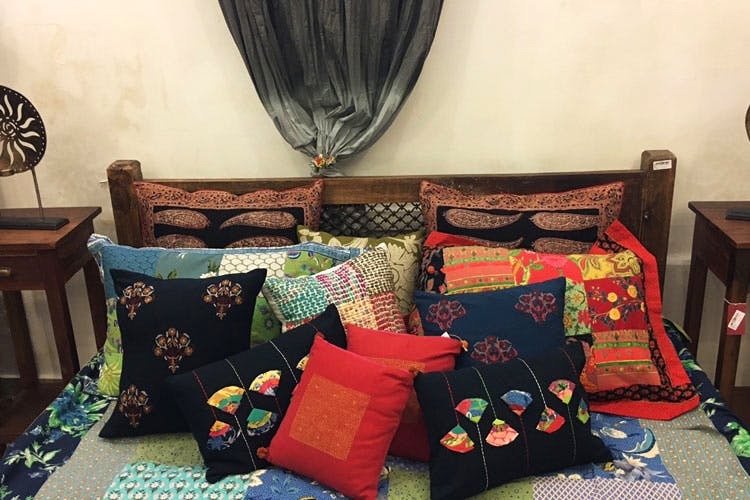 An apparel and home decor shop by the eponymous name The Shop, is our new-found obsession in Bandra, selling cool fabrics and prints just right for the summer. If you’ve been around Bandra long enough you may have stumbled across a brightly coloured pink bungalow across Pali Hill, and shrugged it across as too expensive. We braved on and dared to step inside this well lit store, and were surprised. The Shop is airily divided into mini rooms, one for home décor, another for bedsheets and covers, one for children’s wear and the last two for women’s wear. Gorgeous prints adorn the racks, sweet peaches with florals and bright pinks, jungle green kurtis and light purple spaghetti dresses. Each looked more summery than the other, and we were mentally planning our entire summer wardrobe. To our surprise, it was actually pretty affordable, and a loose summer dress we bought was for INR 1050, and other kurtis we saw too ranged between INR 1000–2000. The home décor section too is beautiful, and the cushion covers start at INR 250 a piece. On a casual evening, just take a step inside this beautiful store and treat yourself to one nice thing packed in a brown paper bag. We promise it will make your day.